vXone is an operator-less, free-to-use, decentralized, highly dynamic, ad-hoc, local area mobile network. It can be viewed as a localized version of the operator-based mobile cellular network but using Bluetooth, WiFi and WiFi-Direct unlicensed technologies instead of GSM licensed technology. vXone can be placed at any confined place with mobile traffic, e.g. shopping malls, university campuses, office buildings, hotels, hospitals, sports and social clubs, air ports, public parks, Hajj, etc. vXone users can enjoy all types of voice and data communication without having to have an operator SIM card. XoneBee’s various types of gateways installed along with vXone network allows mobile users to communicate not only with other users of the same vXone network, but also with distant users who can equally be using a legacy mobile network, internet or even another vXone network. Environment, weather, moisture and humidity sensors. Proximity, motion and presence sensors. Position, angle, displacement, distance, speed and acceleration sensors. Force, density and level sensors. Thermal, heat and temperature sensors. Acoustic, sound and vibration sensors. Optical, light, imaging and photon sensors. Electric current, electric potential, magnetic and radio sensors. Flow, fluid and velocity sensors. This allows mobile users to have access to big data conveyed from the connected sensors. Similarly, vXone network elements can also be connected to wide range of market available actuators. These actuators can execute physical actions like opening/closing doors, igniting motors, switching on/off light, firing guns, locking/unlocking safes, etc. Imagine vXone covering Hajj with all types of sensors being connected to its network elements. Hajj administration can sense an immense amount of precise data, analyse/report them and take actions to be executed at the network elements sites, e.g. opening/closing gates, controlling security systems, spraying water to moisture hot places and more. Some privileges can also be granted to pilgrims like tracking their children or elderly people. This clearly positions vXone as a leading platform for an unlimited number of future Mobile Internet of Things applications. Such applications go way beyond the support of current mobile networks. Think of wearable devices being connected to vXone! shopping experience in a shopping mall covered by vXone! social connectivity in a club connecting people using vXone! Sky is not even a limit to the number of innovative applications that can be deployed over vXone. CordleX is a solution that enables mobile users to make voice calls and exchange data for free over landline telephone network. 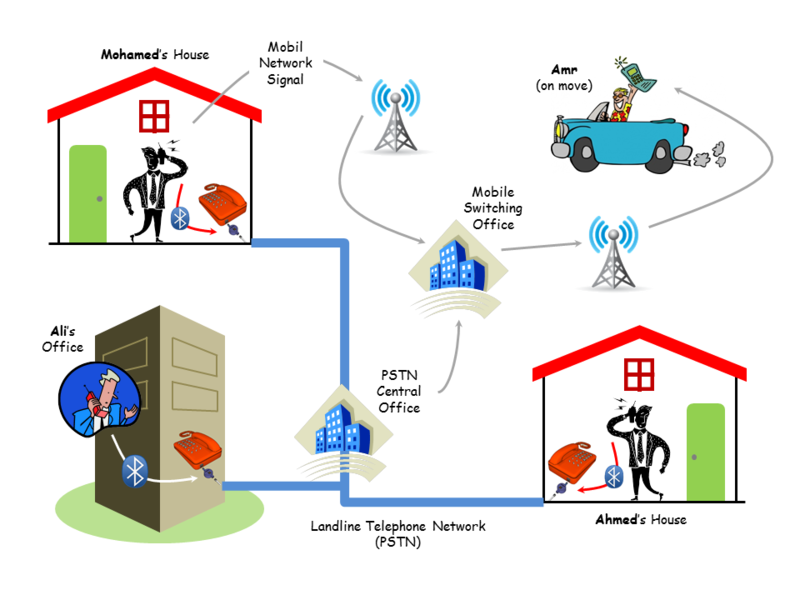 It works completely independent from both mobile and landline operators and it doesn’t require an internet connection. CordleX gadget is a matchbox-size electronic device that can either be connected to the LINE-IN interface of your landline telephone set, or directly to your fixed telephone line outlet. It’s powered by the telephone line itself with no need to be connected either to a mains source or even a battery. CordleX works like a wireless gateway to enable your smartphone to be paired with your landline and hence act like a cordless telephone handset, not only making/receiving voice calls, but also exchanging unquoted data. A single CordleX device covers a circle of up to 450 meters, making it suitable to be used not only by individuals, but also by corporates as well as governmental establishments. 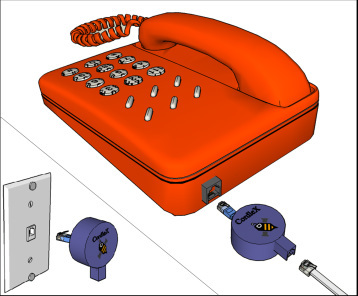 CordleX creates a new generation telephony platform that integrates landline telephone set with smartphones in a cordless telephone fashion. This platform can potentially replace the landline telephone set completely and opens the room for a new era of telephony applications.